Contribution to the Tribune by Pedro Abad Santos commenting on Roy Howard’s article. A very shrewd analysis of the present situation. So far as Quezon is concerned, I do not really know his views of the future –I discard that part of Santos’ article which deals with the working classes, for while now suffering from economic depression, they are certainly on a much higher standard of living than any others in tropical Asia. (e) The embarrassment of Blunt over the interview the London Times man (Stevents) had with Quezon etc., etc. (f) The anxious enquiries Quezon made of me as to the utter dependence of England upon holding her Empire together etc., etc. This is haute politique indeed. J. Ross told me that Quezon is in favour of independence if that is safe (so is J. Ross!) that at the moment he is badly scared over Japan; that England appears to be an “anchor to windward” (words mine); that three years ago Quezon told him that the United States was going to “kick us out” and Quezon was then in favour of going to London to talk with the Foreign Office; J. Ross told him that the Foreign Office would not talk with him. 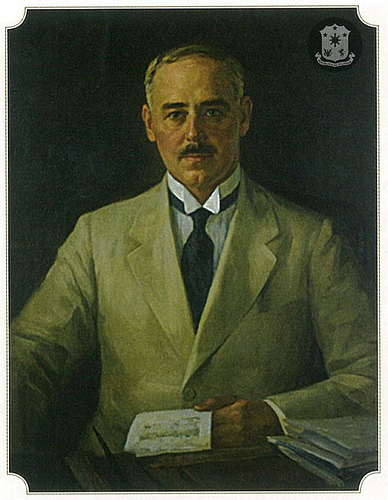 That Colonel Frank Hodsoll told J. Ross that he (Hodsoll) had been asked by Quezon to talk to the British Ambassador in Washington and had done so. J. Ross and I agreed on the reasons for the attacks on me here –that I was believed to be in favor of quick independence and that they believed my own Government here had damaged business (Wood-Forbes Report); J. Ross thought it would die down soon. Elizalde’s opposition to me was due to his jealous wish to have a controlling influence over Quezon. The most surprising symptom I have found here this time is the utter lack of self-confidence among the Filipinos! J. Ross asked me if I did not think Quezon could lead his people into a Protectorate –I said he could lead some of them, but that denial of independence was a cartload of dynamite. Doria left at noon en route for the Mt. Data Christmas party of Heine Schradieck of the Standard Oil. Amazingly enough, I remember how I had interned Schradieck together with the other Germans in the Philippines when we entered the World War in 1917. Saw Secretary of Agriculture Rodriguez, former Governor of the Province of Rizal, concerning the dispute between Binangonan and Cadorno municipalities. Saw the President at Malacañan at 6 p.m.; he was about to start for the National Assembly which was ready to adjourn. He was in the barber chair now established in the Palace and he received my account of my interview with Blunt with alert interest. His mind was taken up, however, with a pending dispute between the Jesuit Friars and their tenants on some unspecified hacienda. He said he wanted me to help him on it, but what he really desired was a sympathetic audience before which to express his own views. Secretary Yulo was waiting in the next room and joined in the conversation. Quezon said he had sent today for Araneta, the lawyer for the Jesuit Corporation, to prepare the ground before he should see the Administrator of the Corporation tomorrow; that agrarian troubles on this hacienda might result in bloodshed; that he (Quezon) was in favour of justice rather than the law; that these families of tenants had cleared the land and had lived on it for generations –that they practically owned it and had more moral right there than the Friar owners who had not paid originally for the land and had not spent any money on its development. (I interjected the view that as the Friar orders had then been the government they had practically given these lands to themselves, as was customary in Frailandia –that the situation was like a chapter out of Noli Me Tangere –“yes,” Quezon said, “except that now there is no Spanish Governor General to order out the troops.”) Quezon said he told Araneta he would not evict the tenants who had not paid rents and that he would not send the Constabulary to defend the Administrator; that, pending the purchase by the Government of these Friar lands (or alternative measures) he considered the tenants had more moral rights than the Friars –that if these people were dispossessed more “communism” would result; that he did not care to make any public statement of his views, because in this case there might be outbreaks instigated by demagogues. During the morning, Quezon had signed the National Defense Act in the presence of Osmeña and MacArthur –movie taken of same. Jim Ross told me he understood “Mike” Elizalde was out as head of the National Development Co.
Sunday a.m. Malacañan Palace was thrown open to the public by the President’s orders—crowds of tao sightseers—Quezon’s about to leave on Banahao for Zamboanga with Roy Howard and his family as guests. He had originally invited Jim Ross and me on this trip but did not renew the invitation, for which, at the moment, I am relieved. I asked him to fix definitely my status, and he cordially agreed to make my appointment as one of his “technical advisers” valid tomorrow –salary 15,000 pesos which he said was the same as that of the Vice-President and next to his own, the largest under the government. Read to me two editorials in the Tribune of that date unfriendly to his government and asked me to see Alejandro Roces, as his friend, and call his attention to his promise to support the administration. Also listened to my opinion on the proposed purchase of the Manila RR. bonds. Said it was much the same as Foley’s –whom he asked me to see. I expressed a desire to begin a study of papers on propositions to reform the Government now on file in Malacañan. He looked well, and is still on a milk diet. Said he would be back from the Southern Islands by Saturday next. At 6 p.m. Doria gave a party at the Polo Club for Mrs. Stevenson, Mrs. Walford, Mr. & Mrs. Peters, Count Churruca, Correa, Lea, and Mr. & Mrs. Satterfield.